As you probably heard by now in September, the DCnU (DC new Universe) will begin. One of the changes that will happen is Barbara Gordon, who for the last 22 years has been in a wheelchair fighting crime as Oracle will be able to walk and become Batgirl again. As Oracle, she used her photography memory and computer knowledge to to help other heroes, especially the Bat family. More importantly, she became a role model for people with disabilities. So now that is being reversed and the outrage is there, but I ask myself...why? The response is that she is a better character in the chair than being a bat-clone. Really? That seems funny to me. She should be an interesting character whether or not she's in the wheelchair. Let e give you an example of someone with a disability that has been overlooked. 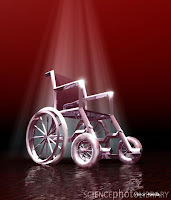 Professor Xavier (or Prof. X) - one of Marvel's most powerful mutants - is also in a wheelchair. He's regain and loss the use of his legs a few times, but where's the outrage? Where are the people with disabilities saying HE'S a role model? The character was introduced back in 1963 IN THE WHEELCHAIR! Not only does he have a disability, he's a mutant! But it seems like he's ignored and I don't know why. Is it that they have shown that Barbara can take care of herself? Well, Xavier can too. I can't recall right now a time where they have showed him in a physical confrontation, but when he can make a guy who can bench press 300 lbs. think he's a four year-old girl named Mary, does it matter? Look, it's not that I don't enjoy Oracle, I enjoy Barbara Gordon. Is it fair that she stays in a wheelchair and see Bruce Wayne return from a broken back, Roy Harper get a cybernetic arm, Cyborg become...well Cyborg, and a number of people come back from the dead? From what I've been led to believe, she will be using cybernetic technology to move again. That doesn't mean it'll be permanent. She may decide that she isn't interested in patrolling in the cape and cowl, or something may go wrong and she's back in the chair. We just don't know.